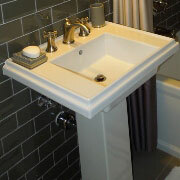 The bathroom is one of the most important rooms in your client’s house and they will spend a great deal of time there. The features and fixtures that make up your client’s newly-remodeled bathroom should not only serve their needs, but should make them feel comfortable. At ProSource® of Cleveland, we offer a vast selection of high-quality bathroom sinks, faucets, showers, vanities, bathtubs, and toilets that will transform their old bathroom into a luxurious oasis. There are many things to consider when choosing your client’s new bathroom sink, like how much space you have to work with and what purpose it should serve. Whether you are remodeling your client’s guest bathroom with glass wading pool sinks that will leave a lasting impression or are simply upgrading their old sink to a more practical model, our selection of wholesale bathroom sinks includes every kind, shape, style, material, and color sink you could possibly imagine. 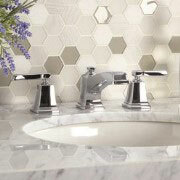 Sink faucets have the potential to make a statement in your client’s bathroom if chosen correctly. Here at ProSource of Cleveland, our collection of faucets includes a variety of cross, knob, lever, oval, swing lever, and custom styles that will look amazing in any newly-remodeled bathroom. When doing a bathroom remodel, trade professionals know just how important it is to choose the kind of shower that best fits their client’s needs. Whether your client is ready for a complete shower upgrade or simply needs a new shower door, handle, or heads, we have a range of showers and accessories for them to choose from at ProSource of Cleveland. Your client’s vanity is one of the most admirable components of their bathroom, especially when it is made with beautiful materials like fine woods and precious metals. 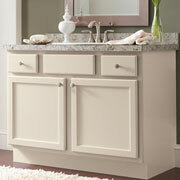 Our selection of bathroom vanities rivals that of our competitors’ in both quality and price, and includes a range of options that fit any size and style bathroom. Bathtubs, while not the most used feature of every bathroom, hold a sentimental value for many trade pros and their homeowner clients. 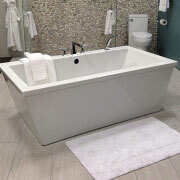 If your client wants a tub that evokes a sense of class and timelessness, choose one of our clawfoot, freestanding, or alcove bathtubs. Or, if you are transforming their bathroom into a luxury escape, visit our Cleveland showroom and pick out one of our corner bathtubs today! 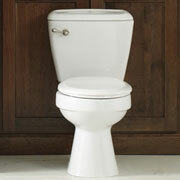 Toilets don’t have to be the feature that dulls down an otherwise beautiful bathroom remodel. Here at ProSource of Cleveland, we offer a wide range of toilets that utilize the latest technology, including our low-flow, standard, and specialty toilets.